1. The violin recently revealed as Wallace Hartley’s aboard Titanic will be going on display this weekend, along with other Titanic memorabilia, at the Belfast City Hall. It is part of a special exhibition that marks Belfast first Royal Charter granted by King James in April 1613. Lisa Morgan, city events officer, says the inclusion of Titanic was important to Belfast as it was built there. 2. A collection of crystal bowls similar to those used on Titanic are being made to mark the anniversary of its visit to Cork. The bowls will be limited editions and for sale in April. *Due to policy of charging for links, we no longer provide them to Republic of Ireland newspapers. As we approach the 101st anniversary of Titanic sinking, a new book argues bad decisions were ultimately to blame for Titanic’s demise. Joseph Mortati, according to the press release, examines the whole Titanic story in a new way–from a business perspective. Starting with the hours before the crash and working back through time, the author takes the reader into the planning and implementation stages of a decade of decisions that ultimately and unknowingly rendered Titanic vulnerable. These sound but fatal business choices were made by stakeholders from the international holding company that owned Titanic down to the engineers, marketers, and ship’s officers. However, these views largely miss the fact Titanic is fundamentally a business venture. By looking at the ship through this lens, it will become abundantly clear that far from being the classic case study of reckless decision-making, the people involved actually make smart business choices. After presenting this view to thousands of businesspeople and business students over the past few years in the Washington, DC area, every audience collectively says, “We would have made the same decisions they did.” If so many people today would have done the same things, that tells us Titanic is actually a story of good decisions that result in bad outcomes. Mortati raises a valid point here. We think of Titanic in a particular way but forget easily forget it was a business. Sure we know of J.P. Morgan, Bruce Ismay, Harland & Wolff. And we know that Titanic and other steamships of that era made money moving passengers and cargo. That was how they paid for the officers, ship crews, all the administrative and support staff, and of course the salaries for those running the shipping line. Mortati is focusing on how good decisions led to a bad outcome and there is a lesson to be learned. So his book is not a history book in the traditional sense, but an examination of the Titanic business. Presumably that means looking into the thinking behind ships like Titanic, how they were marketed, and how successful they were and whether the really understood the risks involved. We know the final outcome: Titanic sank. It’s sister ship Britannic also sank (due to a mine most likely), and only Olympic survived until old age and was eventually sold off for scrap. White Star Line was eventually folded into Cunard during the Great Depression and the age of steamships has since faded into history. Perhaps there really is a business lesson to be learned here. Unfortunately the problem of assessing risk is still a big one. No one considered a small O-ring a major risk until after Richard Feynman demonstrated it but putting one in ice water during the Rogers Commission hearings on the space shuttle Challenger disaster. The famed movie director is donating his deepsea vehicle used in the dive to Challenger Deep in 2012. Challenger Deep is the lowest point of Mariana Trench, one of the deepest seabeds in the world. Its innovative features and design got praise from scientists. No other deepsea vehicle can go as deep as Deepsea Challenger, making it a very important craft indeed. The donation also is another example of a transition from government funded research to private sector. Something that has been slowly been going on for a while. Perhaps one of the first cracks was way back in the heady days of the space program. They needed pens to work in space, which is a problem in free fall (commonly called zero gravity) where common ballpoints fail to work. Fortunately Paul Fisher had been working on a better refill for ballpoint pens. He perfected one using a cartridge pressurized by nitrogen so that it did not rely on gravity to work. This resulted in a pen that worked in space, underwater, upside down, or in freezing cold or hot deserts. NASA had been working on such a pen but had not been successful. Fisher patented his ingenious design in 1965. In 1968 the Apollo 7 astronauts were the first to use the Fisher space pen (it took two years of NASA testing). The rest, as they say, is history. You are invited to leave comments. All comments subject to approval to prevent spam. 1. A rare Titanic menu will going on display at Titanic Belfast vistor center starting 26 Mar. The menu, a first class luncheon menu dated 14 April 1912, was in the purse of Titanic survivor Ruth Dodge. Ruth, her husband Dr. Washington Dodge, and their 5 year old son Washington Dodge, Jr. survived. Washington Dodge would commit suicide in 1919. * The menu displays the list of dishes for the final first class luncheon. It was auctioned last year and purchased by Rupert Hunt. Hunt decided he wanted other Titanic enthusiasts to enjoy viewing it. The menu will join other artifacts already on display: Titanic Inquiry Plan, Titanic surgeon Dr. John Simpson’s letter, Harland & Wolff ship launch and salary notebooks. *Further information on Dr. Washington Dodge can be found at Encyclopedia Titanica. 2. Zombies are popular today (actually they are ghouls rather than the classical zombie) and so it is no surprise someone has penned one dealing with Titanic. Jess d’Arbonne at Examiner.com reviews Deck Z:The Titanic Dead by Chris Pauls and Matt Solomon. A zombie plague breaks out on that fateful voyage and feeds into the modern day zombie plague stories. He gives it a positive review. Just wondering if the next new frontier for zombie fiction will be the land of Oz or perhaps a fairy tale world? 3. British drinkers of Titanic Brewery beer can enjoy their pints a bit more these days. The price of a pint had risen due to taxes but thanks to a recent government reversal that lowered taxes, Titanic Brewery lowered its prices. Okay this is not about Titanic but when a government decides to tax less, that is news. Especially if it reduces the cost of a pint by 5p. Want to comment on this entry? You can by clicking on Leave A Comment. All comments subject to approval (to prevent spam). This route currently goes from Pacifica to San Bruno BART (SBB) daily and weekend. The original proposal was to cancel the school trips to Parkside and make kids transfer to the 141 at SBB. This has been reinstated but there is only one bus service in morning and afternoon. Both the 141 and 140 serve Parkside. Now for the changes. The Allen Drive crossover from College to Longview is gone. The 140 will now go down College and turn right on Longview and from there go over to Sneath down to Skyline as it does now. The route remains unchanged through Rollingwood but there is a major change after that. The Bayhill, San Bruno Avenue, and Huntington portion has been deleted. From Rollingwood, the 140 will go directly to SBB. That means if your destination is Bayhill, you will have to transfer to a 141 at SBB or walk from Cherry & Sneath (a long walk). If you used to catch the El Camino route buses (390/391) at San Bruno Ave & El Camino, you will get off at Sneath and El Camino. The major change is that service to Third Street, Angus, and San Mateo Ave is dropped (except for school trips). The new route shifts the 141 to San Bruno Ave and presumably stop right near the completed Caltrain station. The 141 will go up San Bruno Ave to Crystal Springs, head over Jenevein and down to Cherry, turn on Cherry back to San Bruno Ave, and from there back SBB. Routes 390/391 (the El Camino bus lines) are currently combined on weekends will be combined on weekdays dropping San Francisco stops since most people take BART or Caltrain into the city. Many people, the figures reveal, take the 390 to Daly City to catch BART as it is a cheaper ride. Currently the 391 (not the 390) pulls into SBB. The draft plan drops SBB on weekdays (it already does so on weekends) meaning no ECR service to SBB. People going to SBB or Tanforan using the ECR will have to get off near Sneath and walk to it. Alternatively one can get off at San Bruno Ave and catch a 141 inbound to SBB. SBB is right behind Tanforan and a much easier walk that crossing the busy El Camino where some drivers are not always observant of pedestrian right of way even when you have the walk sign blinking madly at them. My thoughts: The thinking behind these changes is efficiency. SamTrans has a huge deficit and only four lines make money for them (120,390,391,292). The 140 and 141 directly effect San Bruno residents as they are two major routes other than the ECR that service the city (the 123 goes through Rollingwood to Skyline College but is being cancelled). The other marginal one is the 133 which passes through San Bruno and stops at the Post Office and SBB. That route is being modified with the San Bruno section deleted. Now I was opposed to dropping the Bayhill/San Bruno Ave/Huntington sections of route 140. It means taking two buses to get there which adds more travel time. And having the 140 feed into Caltrain at San Bruno Ave seemed a good fit along with the 141. People who used to get off at San Bruno Ave & Green (or catch it from the stop near the grocery store towards Pacifica) will now go to SBB to catch a 141 over or catch an ECR that will drop then off near Sneath. Changing the 141 makes more sense and deleting the San Mateo Ave portion saves time and money. I have taken this route from San Mateo Ave and has just a few people aboard. Plus crossing Angus and down Third is tough on the drivers due to streets being narrow. The turn onto Third is really tricky. So the drivers will not miss this section (except on school trips). Discontinuing service to SBB by the ECR is a mistake. This line ought to stop at all BART stations on weekdays along the way and is more convenient for passengers. Having to walk to and from El Camino is going to be a problem, especially those who are handicapped or special needs. It does not bode well for San Bruno having the major north/south bus line just pass by rather than stopping at BART. Understandable on weekends when passenger traffic is absent at SBB but not on weekdays. They ought to keep it and the San Bruno City Council ought to be yelling about this. And while they are yelling, do so at BART for how filthy the place is. Because it is like an underpass, garbage and food debris is scattered about often and not cleaned up. It is not a nice place and poorly designed (perhaps by the same people who created elevated railways in cities creating dark zones). The proposed change is supposed to make the ECR run more efficiently. Right now it runs pretty badly. Buses rarely run on time, often overcrowded, sometimes just never show up. You cannot rely on the ECR to get you someplace on time. You have to factor in lots of extra time since it rarely meets the schedule. Combining the routes will supposedly mean it wil run every 15 minutes. If you hear lots of chortles over that, your right SamTrans. No one buys it. In fact, many will not be surprised if it just the same as before. It is not to late to voice your opinion on this. The San Bruno City Council ought to be upset with the ECR not stopping in San Bruno and make it known. You can find info about how to send comments by going here. Originally the changes were scheduled for August 2013 but that has become less clear with some changes to be implemented this year and some in 2014. 1. Titanic:The Artifact Exhibition opens this Saturday at the New Mexico Museum of Natural History and Science in Albuquerque, New Mexico. The exhibit runs from 23 Mar through 27 Oct. It is open daily from 0900 to 1700 (9am-5pm) except for Thanksgiving, Christmas, and New Year’s Day. Admission is $18 adults, $15 seniors, and $11 children. The prices include general museum admission. 2. Jewels of Titanic are now on display at Titanic:The Artifact Exhibition at Luxor Hotel, Las Vegas. They will be on display through 31 May. For information about dates, times, and admission prices, go here. 3. Some people are going to call this ironic, others comic. It seems Clive Palmer, the man behind Titanic II, had a slight problem with his super yacht. Aptly named “Maximus,” its crew was forced to call for help when it lost power and started drifting towards rocks at Wavebreak Island in the Gold Coast Broadwater. Emergency crews responded and pulled passengers and crew (wearing lifejackets) to safety. And it is not the first time something like this has happened. A similar Palmer vessel ran aground a year earlier in Gold Coast Broadwater. Let the jokes fly! Various newspapers are reporting that skepticism over the Hartley violin has arisen. 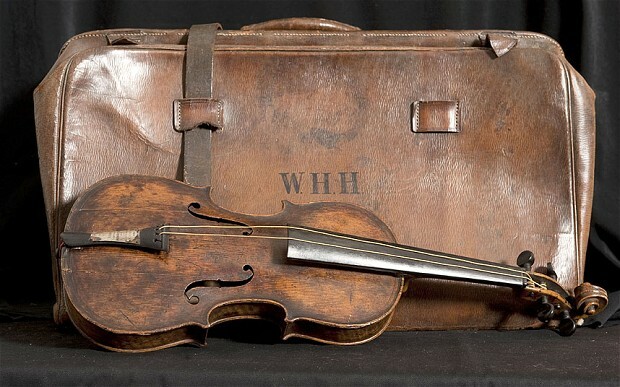 To recap: Henry Aldridge & Sons auctioneers announced that after six years of forensic examination and detective work, they have authenticated a violin owned by Wallace Hartley and was found with his body in 1912. However Karen Kamuda of Titanic Historical Society and Nigel Hampson of Titanic in Lancashire Museum dispute it. Both point out that inventory of items shows no violin was found on his body. No one is doubting that Hartley owned the violin but whether or not it was the one used aboard Titanic. Aldridge rebuts the charge by pointing out they conducted many tests on the violin (such as chemical), and uncovered a telegram from Maria Robinson to Nova Scotia officials thanking for the violin. Such tests would, I would assume, be available to the museums, exhibitions, and private collectors wanting to make sure the violin is genuine. So what about the inventory? Well there are two plausible explanations. One is that no violin was found which would cast doubt on the violin in question. The second is that Nova Scotia officials altered the records so that no one would raise any question about a violin being handed over to Miss Robinson. The family likely knew (since she was engaged and purchased the violin for him) and did give her his other personal possessions. In truth, we will never know but the telegram certainly indicates the Nova Scotia officials gave her the violin. Certainly though raising questions is a good thing to keep things honest in this whole process. While I can see some small operator trying to con a buyer, I doubt Aldridge would do this. The risks are too high with the entire world looking at it under a microscope.